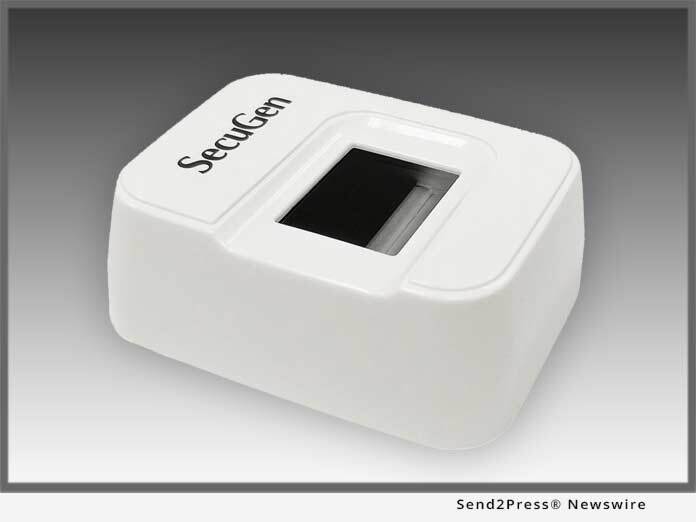 SANTA CLARA, Calif., Dec 04, 2018 (SEND2PRESS NEWSWIRE) -- SecuGen, a world leading optical fingerprint device and technology vendor, is pleased to be featuring the Hamster Pro(TM) 10, an FBI certified and ultra-slim fingerprint reader, at the 2019 Consumer Electronics Show in Las Vegas. The Hamster Pro 10 is a sleek and ultra-slim fingerprint reader priced for large scale deployments. It is FBI certified for high image quality called for by FIPS 201 PIV and Mobile ID FAP 10 environments. Compatible with SecuGen's free SDKs for Windows, Linux, and Android, the Hamster Pro 10 also works right out of the box with Windows Hello for convenient fingerprint login to Windows 10 computers. "As our customers expect, the Hamster Pro 10 is another high-quality fingerprint reader," stated Jeff Brown, VP of Sales and Marketing for SecuGen. "Not only does it meet the image quality standards of the FBI Mobile ID FAP 10 specifications, but it is also very attractive in its slim, white case. The case of the Hamster Pro 10 is a 'tour de force' unlike any of its predecessors, and our partners love the new product." Dan Riley, VP of Engineering added, "Our engineering team did a great job with this new fingerprint reader. To begin with, we designed an optical sensor module that is the smallest FAP 10 optical sensor in the industry. This was accomplished without sacrificing quality which was no small feat." "We are continually expanding our product line in response to the requirements of our partners," stated Won Lee, CEO of SecuGen. "Our focus is, and has always been, to design and deliver products that can help our partners succeed in the marketplace. The Hamster Pro 10 continues this focus." The Hamster Pro 10 will be demonstrated at CES 2019 in SecuGen's booth # 35232 in South Hall of the Las Vegas Convention Center, from Tuesday, January 8 through Friday, January 11. SecuGen Corporation (Secugen.com) is the world's leading provider of advanced, optical fingerprint recognition technology, products, tools and platforms for physical and information security. SecuGen designs and develops FBI-certified fingerprint readers and OEM components, developer kits and software, including NIST/MINEX-compliant algorithms. SecuGen(R) is a registered trademark of SecuGen Corp. in the United States and other countries.